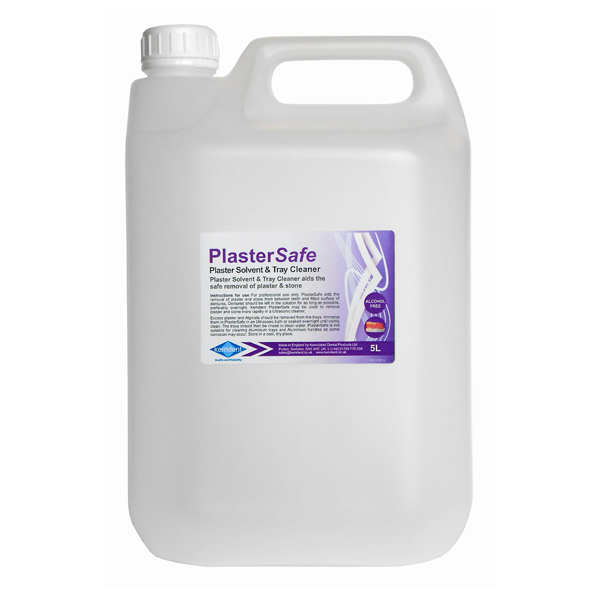 PlasterSafe - Plaster Solvent and Tray Cleaner is alcohol free, ready to use solution that aids the safe removal of dental plaster and stone from the fitted surface of dentures and the hard to reach areas. PlasterSafe is kind to the technician's hands, it is a water based solution with no harmful chemicals. It is also easy to use, just remove any excess plaster or alginate, then immerse your trays in PlasterSafe. This can be done rapidly in an Ultrasonic bath or soaked for as long as possible. The plaster dissolves and the trays can be rinsed quickly and efficiently in clean water.